As Reliance Jio Infocomm to launch 4G services in next few months, there are lots of updates from the industry. All these updates regarding Jio confirms one single fact that the company is very keen to launch its services before this year ends. Reliance Jio entered into an agreement with DragonWave® Inc., a leading provider of high-capacity packet microwave solutions that drive next-generation IP networks. The deal includes after sales services by DragonWave’s Indian venture DragonWave HFCL. 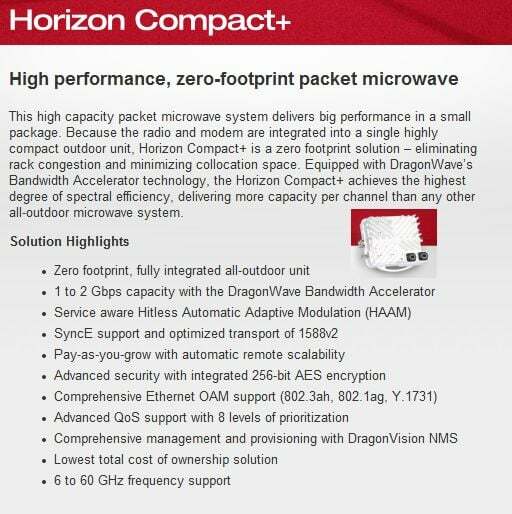 The initial order includes first order of 5,000 turnkey Horizon Compact+ links. Last May 12 DragonWave announced opening of India service and repair center at Delhi to provide full, in-country repair service and support for DragonWave’s entire product portfolio. The new center allows DragonWave to better service its India customers and significantly reduce turnaround times by avoiding delays associated with import/export regulations for repairs made out of country. Subject to Indian regulatory approvals, the facility may be expanded in the future to service international customers beyond India. Interestingly DragonWave and HFCL entered into partnership to form DragonWave’s Indian venture DragonWave HFCL in October 2010, just after 4 months of BWA auction ended in June, 2010. The venture ownership is 50.1:49.9 between DragonWave Inc. and HFCL. DragonWave’s deal is important for Jio, as the company find it difficult to lay OFC in several cities due to obtain RoW (Right of Way) from the governing bodies. That’s why Jio is planning to go for Microwave backhaul as well as fiber backhaul to support next gen 4G networks. Not only that DragonWave’s solutions can be beneficial for creating WiFi services at pockets. Funny facts: After DragonWave made the deal, they published a PR on May 28 without taking the name of Reliance Jio (the first PR quotes as Nationwide Service Provider in India ) and noted about the order as ‘first purchase orders for several thousand links’. Soon after they published another PR as ‘Update’ to previous PR0 as ‘Reliance Jio Infocomm Selects DragonWave Solution for LTE Network‘. The ‘update’ also mentions about first order of 5,000 turnkey Horizon Compact+ links. China based TCL Communications, which makes and sells smartphones under ‘Alcatel One Touch‘ entered into serious talks with Reliance Jio to provide later’s 4G/LTE-TDD smartphone and 4G dongle needs. As Alcatel One Touch Regional Director APAC Praveen Valecha talks, the deal is near to close and they will provide mostly 5” or more screen sized smartphones to Jio. The company already provides Android smartphones with Idea and is in talks with Airtel to offer 4G devices. He also mentions that the company will sell open market 4G devices as soon as the 4G market gets stablised for that, until that they will stick to operators to sell their 4G devices including dongles and smartphones. Jio is testing Alcatel phones and dongles for sometime for its 4G/LTE-TDD network. This week’s 3rd update on Jio comes in a row. After securing the network and end devices, Reliance Industries go for the content for its telecom arm. RIL’s arm Independent Media Trust (IMT) will acquire majority control of Network18 Media & Investments and TV18 Broadcast (TV18). The acquisition is the extension of 2012’s multi-layered complex deal, in which RIL sold its stake in ETV to Network18, while increasing its stakes in Network18. Network18’s assests include in.com, IBNLive.com, MoneyControl.com, Homeshop18.com, Firstpost.com, CricketNext.in and other websites and TV channels like MTV, CNBC Awaaz, IBN7, Colors, CNN-IBN and CNBC- TV18; magazines like Forbes India. With too much bandwidth Jio need contents to engage people over its 4G network, that’s why the deal is needed. “The acquisition will differentiate Reliance’s 4G business by providing a unique amalgamation at the intersection of telecom, web and digital commerce via a suite of premier digital properties.”, as the press release from RIL noted. Already the deal ended upon controversy, as the Network18?s CEO, CFO and COO quit. Many question that will this takeover push paid news for RIL – an end of freedom of journalism.